There can never be too much Turkey! This is a country that is jam packed with so many things to see and do that it merits as long a stay as possible. This 2-week itinerary caters to those who have the time to explore this fascinating country, following the classic circular route that will show you the best, the most historic and by far the most scenic aspects Turkey has to offer. Get a feel for the awesome grandeur of Turkey as you delight in the treasures of Istanbul ranging from the rich and ornate legacy of the Byzantine palaces and cathedrals-turned-mosques to the glory of Topkapi, the pinnacle of Ottoman Empire wealth. 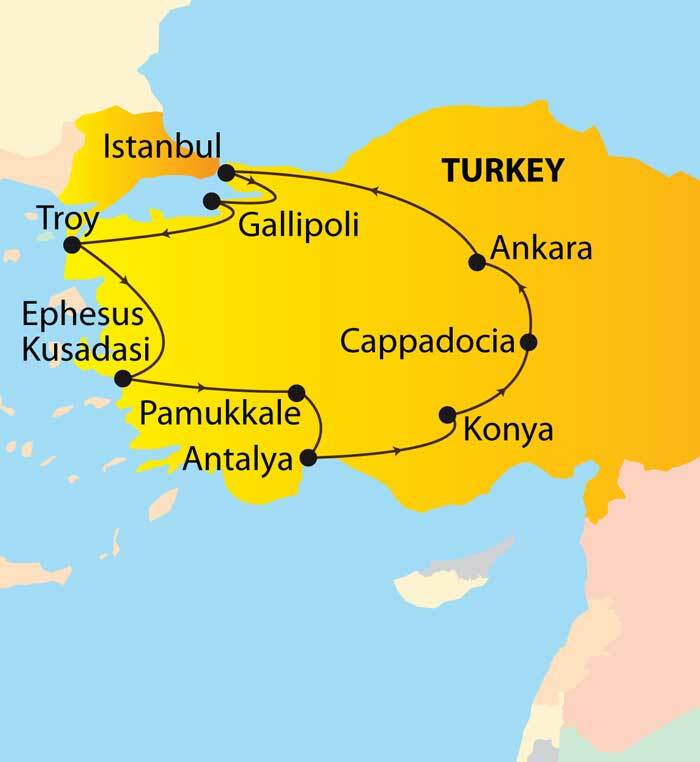 After walking through the Grand Bazaar, head out for the battlefields of Gallipoli, the remains of the city of Troy, then enter a world of the great Greco-Roman ruins that line the Aegean coast. You will find the Roman city of Ephesus awe-inspiring and the site of the Virgin Mary's home humbling. After seeing the astounding hot springs cascading over white, mountainside pools at Pamukkale, head for the Mediterranean and the resort town of Antalya that combines seaside pleasures with Roman antiquities. 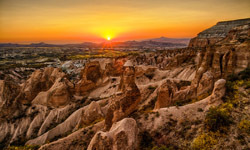 Then it's back into the interior to the heart of Cappadocia, a land of whirling dervishes and extraordinary sculpted landscapes where caves are filled with early Christian frescoes. The tour stops in Turkey's capital so that you can visit the country's premier museums of antiquities before returning to Istanbul at the end of a journey that will never be forgotten. Today we set off on a full day tour of Istanbul. Included during this guided tour are: the magnificent Topkapi Palace (excluding harem), the Hippodrome, the Blue Mosque, St. Sophia and finally the Grand Bazaar. Tonight, there is an optional dinner with belly dancing entertainment (at additional cost). We set off this morning for Gallipoli to visit Anzac Cove, Chunuk Bair, Lone Pine Cemetery and the Gabate War Museum. Afterwards, we cross the Dardanelles to spend the night in Canakkale. Kolin Hotel or similar. Today we visit Troy, with its famous wooden horse, best known for being the setting of the Trojan War, and many cities built on top of each other. Before arriving into Asclepion, enjoy lunch with locals in a traditional local village. Then continue to Pergamum to visit the ancient Medical Center in Asclepion and continue to Izmir for overnight. Swisshotel Izmir or similar (2 nights). Tour the famous ruins of Ephesus, an important cultural center of the ancient world, and explore 2,000 year-old marble streets, a theater, the Library of Celsius, a gymnasium and Hadrian’s Temple. Take a short drive to see St. Mary’s stone cottage where it is believed Virgin Mary spent her last years accompanied by St. John. Continue to a regional rug production center to have a firsthand experience of this unique art form. Optional: Dinner at local restaurant. Drive through lush valleys to Pamukkale, the Cotton Fortress, with white lime cascades formed by hot mineral springs. Visit ruins of the Roman health spa of Hierapolis and enjoy a swim in your hotel’s thermal pool. Colossae Thermal Hotel, Pamukkale or similar. Today is a free day to explore on your own. There are also a number of Optional Excursions (at additional cost) such as a tour of the ruins at Phaselis or a relaxing yacht cruise along the Turquoise Mediterranean coastline. Dinner at a special local restaurant. After breakfast depart for Konya, en route visit the ancient city Aspendos, known for having the best-preserved theater of antiquity. Visit the Mausoleum of Mevlana who was a Sufi philosopher. This was also the dervish Lodge of the Mevlevi Order, better known as the Whirling Dervishes. Continue to the Karatay Koran School, an 800 year-old building, once a Selcuk Islamic theological seminary, which houses an outstanding collection of ceramics and tiles. Overnight in Konya. Hilton Garden Inn or similar. In the morning, drive to Cappadocia, the land of the fairy chimneys. En route, visit a 13th century caravanserai. Pay a visit to the underground city of Saratli, one of the many underground settlements built for protection and religious reasons. Enjoy dinner at a local restaurant and join an optional Whirling Dervishes performance. Nevsehir Kapadokya Lodge or similar (2 nights). Early this morning there is an optional Hot Air Balloon excursion (at additional cost) where we float above volcanic valleys with their fairy chimneys and caves as the sun rises over Cappadocia. After breakfast visit Goreme, a historical region of Turkey, located among the rock formations, which was first settled back in the Roman period. Many rock churches can still be seen today, as Christianity was then the prevailing religion in that region. Continue to the town of Avanos renowned for its high quality earthenware. Also visit Pasabagi, Red Valley and attend a brief regional pottery workshop in a cave. In the morning, depart for the capital city of Ankara through the salt lake area. Enjoy an afternoon tour of the Ataturk Mausoleum and the Museum of Anatolian Civilizations, a historic caravanserai holding artifacts from up to 7500 years old including the most extensive and valuable collection of Hittite artifacts in the world. Ankara Hilton Hotel or similar. After a scenic morning drive we arrive in Istanbul. The afternoon is free to explore this exotic city on your own or take an optional excursion (at additional cost) of a cruise on the Bosphorus including last minute shopping in the Spice Market. Tonight we bid each other goodbye at a farewell dinner. Radisson Blu Sisli Hotel or similar. After breakfast we will transfer you to the airport for your flight home.